When Laisné Hamilton says she loves volunteering, brain chemistry is at work literally producing a pleasure chemical in the body called dopamine. According to David J. Linden, professor of neuroscience at Johns Hopkins University, “Your brain’s pleasure circuits are activated by acts of charity.” The London School of Economics examined the relationship between volunteering and measures of happiness in a large group of American adults. 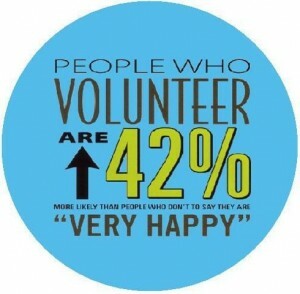 They found the more people volunteered, the happier they were. “If I can help people feel they are not alone and feel valued, I will be happy”, says Hamilton. A retired school teacher, Hamilton makes time in her life to give back to the community she loves by volunteering. She is one of a group of singers who entertains the residents of Rocky Point Care Center in Lakeport weekly. She volunteers to work at bereavement camps and visits home bound patients for Hospice Services of Lake County. She is active in her church, sings in the choir and likes to garden. Hamilton finds that her efforts to give back have become a “paying it forward” experience. “It is amazing that with all the volunteering with clients, office help and camps, the more I give, the more full I feel”, says Hamilton. “My fellow volunteers are encouraging and uplifting.” And that’s another benefit of volunteering: the interaction with others helps develop a solid support system, which in turn protects against stress and anxiety. In addition to the happiness effect, the act of volunteering has multiple mental and physical health benefits. Volunteering can provide a healthy boost to self-confidence and life satisfaction. In doing good for others and the community it makes a person feel better about themselves and more likely to have a positive view of life and future goals. Having regular activities with other people also prevents social isolation which is a key risk factor in the development of depression. Volunteering is a fun and easy way to explore your interests and develop new ones. Doing volunteer work that you find meaningful and interesting can be relaxing and an energizing escape from your day-to-day routine. You will have a richer and more enjoyable experience if you take some time to identify what you enjoy doing and are capable of doing. A good match benefits both the volunteer and the organization, and you don’t have to limit yourself to one organization. At Hospice Services of Lake County there are many volunteer opportunities. Our volunteers donate their valuable time making it possible to hold family bereavement camps and bereavement groups that benefit the community. Volunteers provide home visits to patients to give caregivers a break, many times developing lasting relationships with the families. Our thrift store volunteers help process donations, stock shelves and make change at the cash register. The staff at Hospice values and appreciates Hamilton and all its volunteers. April 12 – 18 is National Volunteer Week. 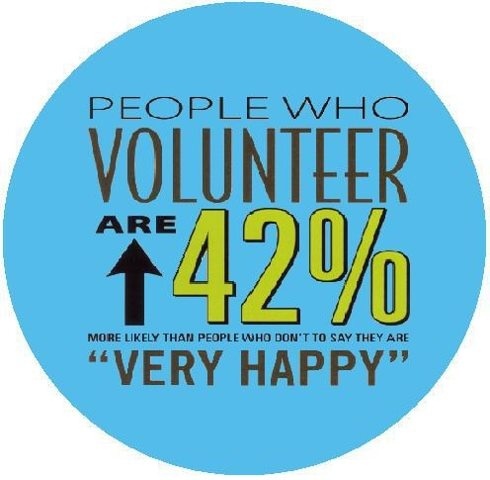 If you know someone who is retired and happy, chances are he or she is a volunteer. Thank them. They deserve it.